I just got off the phone with yet another client with website issues, so I wanted wanted to share some advice on red flags for you to watch for with your own web vendor! This client was wanting to redesign their website (doesn’t have a great look), and at the same time lower their monthly cost. Current vendor is charging per lead – around $150-200/month. My client quickly realized, as we were discussing what features she may want on her new site, that her site can generate those leads and send them to her without paying someone monthly. (Note, no PPC advertising is involved – just a lead form on the website). The vendor will purchase hosting – under their own name. And they will purchase the domain – under their own name. None of this will be purchased under YOUR business name. At some point if a different arrangements works best for your business, and you decide cancel your service with this vendor, they shut off your hosting and your website disappears. Within seconds. And they keep your domain name, because they are the ones who registered it – it’s not in your name. 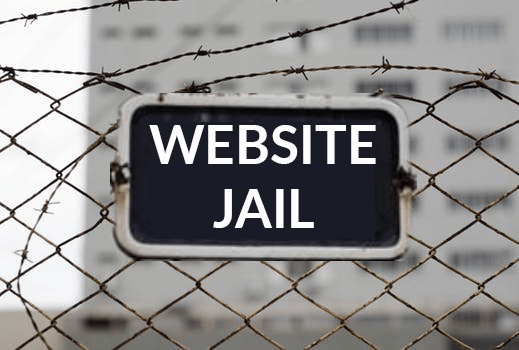 It’s almost like they hold your website hostage or lock it up in website jail. Keep using them or everything disappears. Some even set up a completely separate website (especially in the case of a redesign), so that the website they’re hosting and updating is actually competing against the first one you had, for SEO and leads and customers. Understand, I know why they do this. I’m probably stupid for not setting up this recurring revenue stream in my own business and holding all of my client websites hostage. BUT it doesn’t have to, and in the case of your domain name absolutely should NOT, be this way. We have clients purchase the hosting themselves, and then provide us with login information so that we can work on their website. Most website hosting companies allow you to add users, so this is easy. A few that do not, or the client did not know how to add a user, they provided us the login they set up. The main point – the account is under the CLIENT’s name, and tied to the client’s email – not mine. This means that I can’t keep it hostage or take it away from them. The only time the client pays us a recurring monthly charge is if they are using our full marketing suite, which includes not only hosting but about 20 other website and marketing services all in one place. We have the client purchase their domain name / URL through their own vendor as well. It’s usually the same one doing the hosting but not always. They provide us a user account (or login information) for us to make any changes needed to get the website up and running. This way, they own the URL – not me. Ask your vendor if they are going to be working on your ONE website, or setting up a second one. These are usually on a URL that is more generic than your other one since they can’t take the exact same name. For example … your company name is The Appliance Guru and your website is theapplianceguru.com (I don’t know if that’s a thing, I just made it up), but your vendor sets up dallasappliancerepair.com and is working on only this website. Or worse, finding ways to direct traffic (such as through links) from your existing appliance guru website to the other one – yes this happens! We NEVER set up a second website – unless it is for a completely separate purpose, such as a different product or service line, or only as a temporary measure to let the new site-in-progress be live where you can see it (and then it will only be on a URL you own, and everything will be cleaned up when things are done and you will be left with only one website). There was a time having multiple websites worked great for SEO … not any more. And remember, all of the work of updating and SEOing and lead generation and other things that your vendor is doing to that other website … they keep all of it when you cancel. None of the SEO from this second website helps your first one, unless your vendor gives you the URL when you cancel. I’ve never had a client who was facing this type of issue have their vendor give them the URL (although I am always hopeful). An even worse scenario – the vendor KEEPS the website and URL, and turns around and sells the site to a competitor (for that same monthly fee, and they don’t even have to change much of anything), who then gets the benefit of all of the work that YOU paid for over the years. OR … if you’re already locked into the above, at a minimum get in writing – NOW – from your provider that YOU own the domain name and the website and all content. If you ever cancel, you may have to fight to get control of it, but you’ll be more likely to win (although note you may still lose all of your content). Looking for a more transparent company to develop your website? We always provide a free website consultation. This entry was posted in Hacks, Tips and Tricks, Website Samples. Bookmark the permalink.